Fear the Walking Dead: Dead Run is an endless runner that lets you pop some zombies as well. 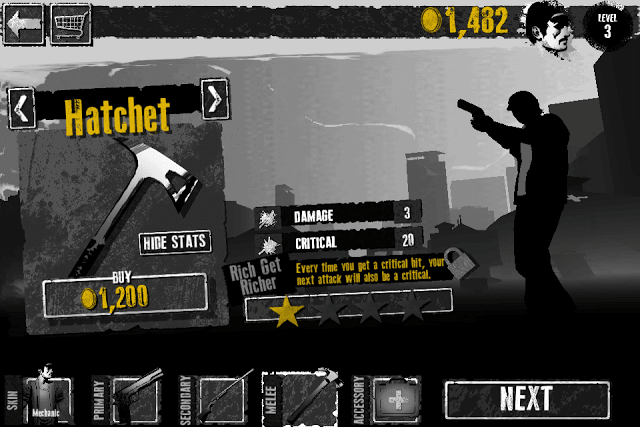 The TWD-themed game gives you access to a variety of guns and melee weapons. Once you equip the best weapons to your character, it’s time to hit the streets. Tap on the infected to blow them apart or use the melee weapon to beat them to death when they get too personal with you. As you run to survive, you can collect loot, including spare bullets and coins, but your goal is to complete 3 objectives to unlock more characters and weapons. The game has two modes – a Survival endless-runner mode and a paid Episodes mode that lets you experience the story. 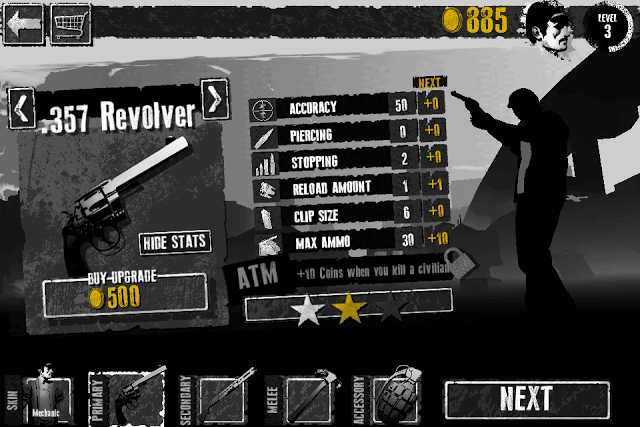 Run to Survive mode is fun and will put your weapon management skills to test. Using in-game money, you will have to purchase and upgrade the right weapons to survive. Follow these quick tips, hints and strategies if you want to travel long distances, eliminate zombies and complete objectives faster. Your guns may well be useful in shooting down zombies from a distance, but it’s your melee weapon that can come really handy in dire circumstances, especially when you are out of ammo. A melee weapon can also be a life-saver when a zombie attacks your character while he is reloading or when a walker quickly runs towards him. Make sure you tap the screen rapidly to eliminate him to avoid losing HP. 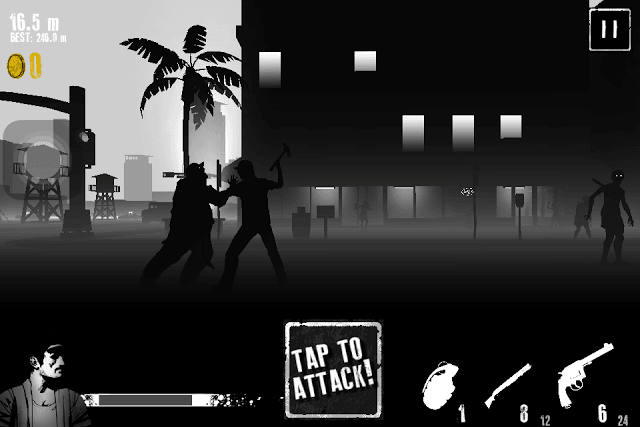 Before playing “Survival” mode or “Episodes” tap “Melee” to select a better melee weapon. Select the one that has better “Damage” and “Critical” stats. I chose Hammer because of its higher damage and Crit chance. With the hammer equipped, my character could eliminate walkers in a few hits. Don’t forget to upgrade your melee weapon if you want an increase in damage/critical stats. Upgrades for a weapon can be locked. You will have to reach a particular player level to unlock them. You may get melee weapons as rewards for completing missions, but new weapons that you receive won’t be available until you reach a certain player level. Once they are unlocked, you can purchase them for coins. You can see your level at the top-right corner of the screen. Tap it to see detailed stats, which include Kills, Headshots and Civilian Rescues. 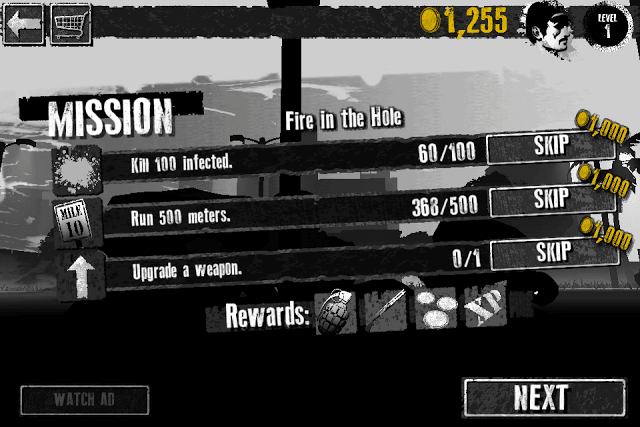 Keep playing Run to survive mode and complete all 3 objectives in a mission to earn XP. The more XP you earn, the faster the level meter fills up. Each mission has three unique objectives that need to be completed to get bonus rewards like coins, skins, new weapons and lots of XP. Objectives vary from eliminating an X number of zombies to breaking glass shards. Achievements-based objectives are hardest to complete. For example, in the sharpshooter objective you will have to get the Sharpshooter achievement 10 times. To earn a sharpshooter achievement, you will have to get 5 headshots in a row while playing. Such objectives are difficult to complete, but the good thing is that mission objectives that you have completed so far are saved, so you won’t have to start from scratch after your character dies fighting the undead. If you have completed 2 out of 3 objectives, then brace for tougher zombies. They won’t let you easily complete an in-game objective. Try to complete the in-game objectives first or upgrade your weapons soon after you complete 2 goals. The more distance you cover running and gunning zombies, the more coins you will earn. Keep running and killing the infected. Invest in a good melee unit because it will help you eliminate zombies when you are out of ammo. You also receive money for killing the infected. In fact, most coins from the total coins earned are from killing the infected. To earn more coins from infected kills, purchase and upgrade better weapons, including secondary weapons. Create “Chaos” by smashing window panes, destroying gas stations and killing a civilian or two. The more chaos you create, the more coins you will earn. Watch a video to earn 200 coins. Rate the app and get extra 300. Level-up your character to get lots of coins. Spend them wisely on skins, weapons and boosts. You receive extra bucks for rescuing survivors. Tap a zombie when you see it attacking a survivor. Also, don’t forget to tap on coin icons that appear randomly on the screen. It’s fun to blow the heads off of zombies with pistols, revolvers, shotguns and rifles. But you won’t be lucky every time as some zombies are pretty quick in attacking your character. You are definitely out of luck when a zombie starts attacking your character while reloading. In such situations, a melee weapon comes handy, but even it can prove useless if another zombie attacks your character from behind. Just make sure you tap the screen rapidly to kill the front zombie, so that you can deal with the second one. Also, keep an eye on zombies approaching your character from behind and tap to kill them to avoid being sandwiched between two infected blokes. You should keep upgrading your guns because zombies are going to be pretty tough to kill as you complete more and more missions in Survival mode. Upgrade your primary and melee weapon first, but before doing that check their stats and see what stats boost they will get after an upgrade. The game shows a post-upgrade snippet before each stats in yellow color. Not all attributes get a boost. Some upgrades may just increase a weapon’s accuracy, reload amount etc, whereas other upgrades will increase max ammo, piercing etc. Compare the post-upgrade stats of your equipped weapons with other purchased weapons in the same category and see whether they are going to be any better than them after the upgrade. And if the upgrade does make them more powerful, just go with it. Save coins for upgrades, new skins and weapons. Boosts provide XP/coin bonuses for certain actions like number of headshots, distance traveled etc., but they can only be used for the current play session and won’t be carried over to a new play session. In case you have plenty of coins, you may buy certain boosts that directly help you in completing an objective. But I would recommend saving your hard-earned coins for buying upgrades and weapons. Like weapons, skins or characters also have attributes that will help you eliminate zombies faster and cover longer distances. Each skin has attributes like health bonus, shooting accuracy, armor and ammo bonus. A new skin gets unlocked when you complete a mission and its objectives. You can then purchase an unlocked skin, but before you do that, check its stats. Skins are pricey and so you should choose one that boasts balanced stats. Also, upgrade your purchased skins to make them more powerful against the undead. While running and gunning, you will notice ammo and coin icons appearing in the background and foreground. Quickly tap on such icons and your character will shoot to collect them. But if you are out of ammo, you won’t be able to collect them. Just take some extra ammo with you. Go to inventory, tap the Accessory slot and purchase the “Extra Ammo” pack. This will add ammo to the reserve.